If fosters already have a dog – either their own or another foster -- in residence, all the better. The more animals their foster dog meets, the more socialized he will become, the more easily he will handle stress, and the more relaxed he will be around strangers. And it’s a simple matter to add another warm, furry body to their own dog’s daily walks, meal and potty schedules. opportunity of seeing if they themselves are suited for permanent pet parenthood. Buddy is a 10 year old Shepherd mix. Two years ago he was bitten by a rattle snake in SW Michigan. During that time his owners did not seek med Recently his owner decided they could no longer keep him, and wanted a local veterinarian to "make him go away". The vet decided that she could not ethically or morally euthanize Buddy as he had a very strong desire to to live. 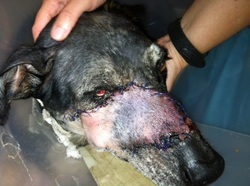 The vet approached Michigan State University about treatment for Buddys wound. 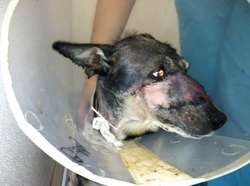 After a series of skin debridements, MSU performed a skin flap. Taking skin from Buddys neck, rotating it and stitching to his face. This is Buddy at his last visit to MSU. They removed his stitches and all looks great! Buddy has a follow up visit in one month to see how he is healing. Buddy will be available for adoption. If you are interested in an older guy that just wants to enjoy life: car rides naps feeling good, then Buddy may be the guy for you! !